Ocean waves near shore impact public safety, commerce, navigation, and, of course recreation. Predicting these waves has driven efforts to model them for more than two decades. This module introduces forecasters to different nearshore wave models, including phase-resolving and 1- and 2-dimensional spectral models. It describes the processes that wave models simulate, the assumptions they make, the initial and boundary conditions required to run the models, and potential sources of error in model forecasts. While focusing on SWAN, the module also examines the Navy Standard surf Model and Bouss-2D. The lesson results should have remained displayed after each sub-section completed, not just at the beginning..
An interesting module which reveals many practical aspects which I didn't find in the textbooks I read. 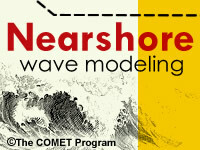 List the major types of nearshore wave models. Describe the model output from the different types of wave models. Describe how SWAN differs from deepwater wave models like WAVEWATCH III and WAM. List the sources and sinks of wave energy in SWAN. Describe the physical processes that SWAN simulates to accurately propagate waves. List the types of initial conditions for a SWAN model simulation. Explain which initial conditions are essential and under what circumstances. List the data sources for initial conditions for a SWAN model run and describe how those initial conditions are applied. Describe the difference between running SWAN in stationary and non-stationary modes. List the advantages and disadvantages for each SWAN mode. Describe the sources of error in SWAN simulations. Describe how the Navy Standard Surf Model works and how it differs from SWAN. List the parameters that are output from the Navy Standard Surf Model. Describe the assumptions of the Navy Standard Surf Model.